It’s Friday 13th, but I’m not feeling superstitious. In fact, I’m feeling very happy as I have finally finished the cosy stripe blanket. It’s quite heavy, but really warm, and both cosy and stripy as the pattern suggests! I worked the stripes until I had run out of parchment coloured yarn, which I had the least of. I overestimated how long it would take, so the need to work a border kind of crept up on me and I had no idea what sort of thing would finish it. A Facebook group I am in gave some very good advice for cosy stripe borders and in the end I settled on ‘spot on‘, which is another pattern created by the talented Lucy of Attic 24. I asked my son which colour he wanted me to use last out of chocolate and khaki, keeping the lighter meadow colour for the ‘spot’ round so that it stood out. 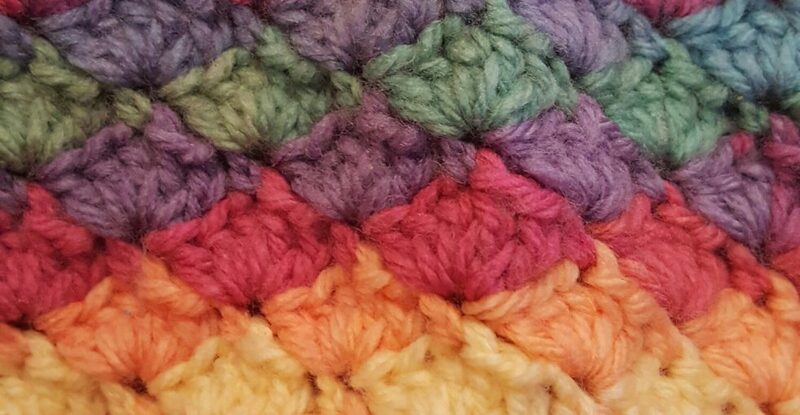 It is just a fraction smaller than single bed sized and was a great use of the yarn I had left over from my husband’s granny square blanket. I have a feeling that it will be misused (or just well used!) for den making, camping, picnicking and many other things. I’m hugely relieved that it is now finished, as although it was a nice simple project, it felt never ending. I used aran weight yarn, so technically it should have been a really quick make. I think because I had stopped completely in the middle of the project (I put it away last May when it got too warm to work on it) it made it hard to gain momentum on it when I picked it up again. Now for more projects, I can’t wait! Have you finished anything this week? Feel free to share, here or on Instagram. Good point! 😂 I don’t think that’ll stop him though. I haven’t finished anything these last couple weeks but I have started two projects! A prayer shawl and a baby blanket. I keep getting distracted by other things that need doing but hopefully they will be finished before summer gets here. Love you blanket! Thank you, hope you get your projects done. This is beautiful! My cousin loves green, and I just gifted her an afghan in similar colours…she would love this one. Thank you, they wouldn’t have been my choice of colours but my husband and son love them! I’m the same, I really didn’t care for the afghan I made for her at first, but my cousin loves it, and that’s what matters. Thank you! It is always fun to plan the next project. Thank you and good luck, I love blankets but am so glad when they’re done. Thank you, I hope he does like it. Oh it looks so lovely! Congrats on finishing! I love this–the colors really appeal to me and the stripes are so crisp! Thank you, it is a lovely simple pattern to follow. Awesome! Love the border it finishes it nicely. Great achievement. Nice colours. 13th doesn’t scare me any more – yay! Thank you, it is super cosy! This is just beautiful to see the finished results, and I can imagine it got too warm to continue.. I started a Scarf before Christmas as a gift to myself.. LOL.. I put it down in January and I have not picked it up again.. As I picked up my paint brushes instead.. In fact the model greenhouse is still pending.. But My focus is coming back again as I feel more like my old self again..